With a stay at Corriegour Lodge Hotel in Spean Bridge, you'll be 16.1 mi (25.8 km) from Ben Nevis Distillery and 18 mi (29 km) from West Highland Museum. Featured amenities include express check-in, express check-out, and dry cleaning/laundry services. Free self parking is available onsite. Take the B5605 signposted from the A483 Wrexham by-pass, fly-over and take the A5152 for access to the Travelodge. Located 2 miles south of Wrexham and 6 miles east of Llangollen. With a stay at Mill House in Morpeth, you'll be on a river, within a 15-minute drive of Warkworth Castle and Willowburn Sports and Leisure Centre. Free self parking is available onsite. Located in Bedford, Queens Head Htl Milton Ernest is within a 10-minute drive of Church of Saint Peter and Bedford Park. Located in Bishop Auckland, Ladywell House B&B is within a 15-minute drive of Low Barns Visitor Centre and Escomb Saxon Church. With a stay at Latimer House in Windermere, you'll be a 4-minute walk from World of Beatrix Potter and 5 minutes by foot from Old Laundry Theatre. Free self parking is available onsite. With a stay at Highlands of Highworth in Swindon, you'll be within a 15-minute drive of Stanton Country Park and Coate Water Country Park. Free self parking is available onsite. 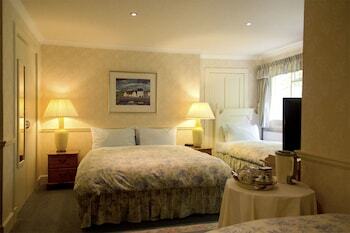 When you stay at The Queens Head in Market Rasen, you'll be 14 minutes by car from Elsham Golf Club. Free self parking is available onsite. When you stay at Queens Apartment in Worthing, you'll be near the beach, within a 15-minute walk of Pavilion Theatre and Worthing Pier.